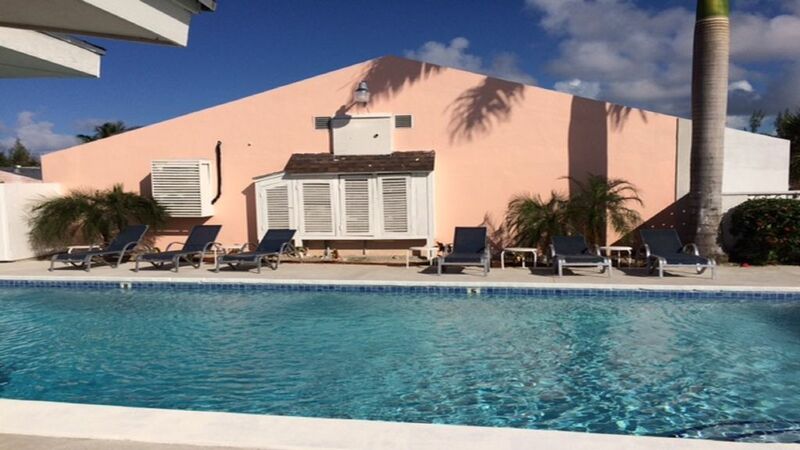 If you're traveling to Nassau this property is the ultimate place to stay. It's within walking distance to Public Transportation, Downtown Nassau (1mile), Junkanoo Beach (1 mile), Saunders Beach(3/4 mile) Ardastra Gardens Zoo (3/4 mile), Historical Forte Charlotte(3/4) and the most popular dining district Fish Fry! I am very hands on with my guest so will surely show you a great time at The Oasis. Welcome! I'm a self employed real estate developer who loves to travel and entertain. The Apartment is very close to downtown Nassau. You can either take a number 10 bus and get there in 2 minutes or walk there in about 15- 20 minutes. The Apartments is very close to Junkanoo and Saunders Beaches. Fully equipped kitchenette with Fridge, Stove, Coffee Maker, Microwave, and all utensils. Contact me if you have specific needs and I will ensure that you're comfortable. I’ve stayed at oasis a few times and would recommended to anyone looking for the perfect Nassau getaway. Always the same professional service. average property. Not close to an actual beach. The property was average, barely worth what you pay. There were live wires exposed due to building work which yes I understand things need to be repaired etc however it’s not safe so I’d be wary bringing children here. The beach nearby isn’t actually a proper beach you can sit on, it’s right by a roadside and there’s no shade etc. Definitely get the bus to Junkanoo beach which is just past fish fry. The area is okay but if we returned to nassau we wouldn’t stay here again. First of the room is not the same one in the picture, the pool is not on site you have to walk over a couple properties to it, the internet is weak, this is not a first floor establishment, we were on the second floor with loud noises from the third floor and openings in the railing big enough that my kid could fall through. There's no floor mat for the bathroom, the tiles are cracked and chipped in shower and my son got a cut from it. There's loud music at 430 in the morning. Took multiple days to ask to get toilet paper, never got a broom to clean or spoons, kitchen is not stocked like it says, stayed somewhere else for one night just to be able to sleep on a bed that's not broken on one side. There's cheaper but better places in the area. Definitely will not recommend or return here. And transportation to airport was jays picking us up. The picture shown in the add is an outright lie. The closest beach is a dump and looks nothing like it. The apartments are located in a trashy neighborhood and a long walk to anywhere nice. I was afraid to leave the apartments after dark. Errol Petty should be removed from VRBO due to misleading and false advertising. Terrible vacation. Would not recommend Errol Pettys rentals to anybody. Avoid them completely and do yourself a big favor. I'm very shocked and disappointed in your review Mr Davenport. As I do with all of my guest upon their arrival, I gave you a comprehensive tour of the neighborhood which included Junkanoo and Saunders Beaches, Fish Fry Dining District, Ardarstra Gardens Zoo, and Downtown Nassau and during that tour your raved on how impressed you were with all these amazing sites that are all within a 3/4 mile radius of the apartment. Thankfully the internet allows future guest to do their own searches of those beaches that you claim are dumps they will see that your claim of them being dumps is an outright lie. Furthermore I saw you walking back and forth to the city centre "at night" almost daily so your claim of staying indoors after dark out of fear is also a lie. All of the pictures on my listing are very accurate of what guest see when they arrive and your review is simply sabotage for your own personal reasons. I have hosted hundreds of guest at this property and 98% have been satisfied with my services. I pride myself on customer service and do every thing in my power to ensure that my guest have amazing experiences. Due to your dishonesty I would not recommend you to any host on VRBO and you should never be allowed to rent from anyone on this site. We stayed here for three nights in January 2018. The house has an overall high standard, is very clean, and is equipped with all the basics needed for a comfortable short-period stay (including a well functioning AC and TV) . The property itself is gated with a parking within the gates, and located in a friendly and safe neighbourhood. There's a minimarket just a few hundered meters away. Within walking distance you'll also find some beaches, Junkanoo Fish Fry, the Zoo, and Fort Charlotte. N.b. that it takes approx 30 minutes to reach the city center by foot, but taxis and buses run frequently at the main street a few blocks down. Unfortunately we never visited the pool (that apparently is at another property nearby). The only things that could improve was: 1) we had a leak in our ceiling one night that caused water soaking our stuff and one of the beds, 2) beach towels are not included in the price (but can be rented at Place), and 3) the room lacked chairs and a table. Our overall impression is that we like this place, and would recommend it to other guests. Thanks for the stay Errol!